Whether it’s James Holden’s Group Humanizer – a device with potentially very broad appeal – or something at the more specialized end of the spectrum such as the Muse Port interface (brainwave control of Live, anyone? ), we’re constantly impressed by the incredible creativity people put into Max for Live devices. Since the release of Push, quite a few interesting and unusual devices have appeared which utilize Max for Live to expand the hardware’s range of functions. 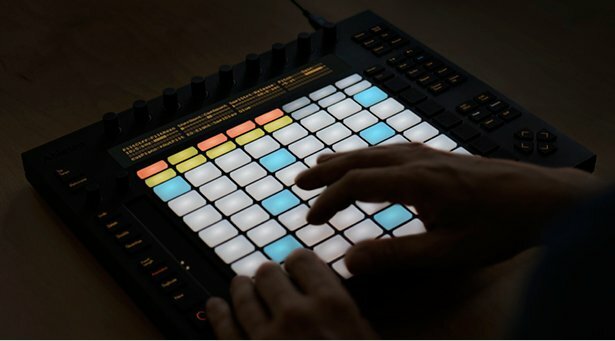 We’ve already covered the video game-inspired Push Pong sequencer and the impressively expressive Aftertouch Mapper, now here are three more great free Push-centric Max for Live devices. Inspired by classic analog hardware such as the Korg SQ-10 and Moog 960 Sequential Controller, Icaro Ferre’s Spektro PS-8 is an easy-to-use, performance-oriented sequencer that utilizes Push’s encoders to change the pitch and velocity of its eight steps. Push’s pads are used to control note on/off, loop start, shuffle amount, gate length, loop direction and provide visual feedback. Download the free Spektro PS-8 sequencer. Constructed by Max for Live expert and techno educator Egnouf/SMAO, Push Skinnerbox is an adaptation of the beloved Skinnerbox 2049 drum synth. Take the six drum synth modules, drop them into slots of your Drum Rack, and voila! Each synth’s wide-ranging parameters are controllable from Push. Create and tweak your own drum sounds on the fly while sequencing – just as Skinnerbox intended it. Get the free Push Skinnerbox here. OmniPush 1.1 by walrusmuse is a Max for Live inspired by the Suzuki Omnichord. It uses Push’s touchstrip to let you “strum” through multiple octaves of glissando notes, either in accompaniment to chords played on Push’s pads, or in a scale/mode of your choosing. You can also adjust note length and velocity of the strummed notes and play through or silence concurrently playing chords. Download Omnipush for free, and get a dose of strumming inspiration with this impressively thorough demonstration video of a vintage Omnichord. Bonus round: be sure to check out the very useful Push Color Picker and Push MIDI Clip Transposer devices from the mysteriously-named Because 789.